The first time the Corp installs a card each turn, you may expose that card unless the Corp pays 1credit. "Is there anything better than free money?" 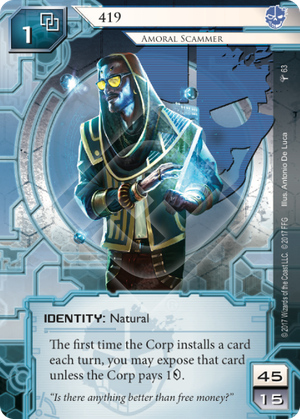 After the Corp installs a card for the first time in a turn, who decides first? (B) Does the Corp decide whether or not to pay 1, allowing the Runner to choose whether or not the card should be exposed? A. The Runner chooses to use the ability, then the Corp chooses whether or not to pay the 1. So, first off, the flavor on this card is killer. The alias used by this runner is a reference to one of the oldest and most pervasive cons in the history of the Internet...the Nigerian Prince scam. That's right. We have a Nigerian criminal hacker who is, in essence, calling himself the Nigerian prince. Sick. Mechanically, the base of his card is pretty boring. 45/15 deck limits, nothing fancy. He gets 1 to start with, which makes it easier to use cloud breakers or Security Nexus, if that is what you want. Nothing interesting to talk about. So let's move on to his ability. The first time each turn the Corp installs something each turn, they have a choice; pay 1, or expose it to you. Now, historically, pure expose effects haven't seen much play. Infiltration managed to survive the core set revision, which is strange, given how rarely it was used. No one ever uses the expose option on Deuces Wild. Lemuria Codecracker was a joke. But this is a little disappointing because, in the game of bluffs and calls that Netrunner should be, knowing the difference between a Wall of Static and a Neural Katana is a big deal. Early game, when you don't have icebreakers, ramming a Wall is a cheap way to cost the corp some credits...but hitting a Katana without a killer means, at best, losing tempo to redraw the lost cards, and at worst you lose a key rig piece or die outright. There was also a consistency issue. Late game, expose effects are not greatly useful; the board state is well established, you have your breakers. It's mostly only useful in giving you a way to dodge a Project Junebug bluff in their scoring remote, which many corp decks don't even use. So you don't want to put in too many expose cards. But putting in only a couple expose cards means not having them reliably when you need them early on. But, 419 changes that. Now, expose isn't a thing you have to add to your deck. It's something you get by default, the whole game, at no cost, repeatedly. That is a terrifying amount of information. Knowing every trap the corp has laid down, knowing every ICE the corp has played, lets you make the perfect move every time. So the Corp is going to want to stop you. And they can do this in two ways. First, they can install multiple cards in a turn. This is only somewhat effective, though; spending an entire turn to install only gives them 2 "invisible" cards and wreaks havoc on a lot of gameplans. The other way is for them to spend 1. That doesn't seem that bad, does it? Here's the thing though. Doing that every turn absolutely kills a corp's economy. Remember the old HB core identity? It was easily the strongest ID in the faction because it generated so much freaking cash. So, inversely, losing 1 credit each turn you install makes a corp broke...which is exactly where Criminals want corps to be. So, your corp can't just give out free information every turn, and they also can't afford to pay up every turn. So you need to prioritize. Give out some information, and keep the important stuff secret. Oh, but then you've just told 419 what stuff is important. After all, you wouldn't pay to prevent exposing a simple PAD Campaign or a Pop-up Window. So if you're hiding it, it must be valuable...or dangerous. So far, though, I've just been describing a vanilla Criminal deck run in 419 instead of, say, Silhouette or Nero Severn. Where this gets bonkers is in the combos and support they added. Aumakua becomes an insane AI breaker--with the amount of exposing you do, and the opportunity to bounce off un-iced remote assets, you can quickly get it to 3 or 4 strength, and cruise through low-strength ice until they purge. Falsified Credentials becomes another three Sure Gambles that can be played from 1 credit. Blackguard is okay, but is not as good as 419's own console Zamba, which is a respectable 4 for 2...and makes it so the corp has to choose between paying, and letting you get paid AND see their stuff AND buff Aumakua. But you'll notice that while these abilities are all really strong, the combo pieces are all very simple, and there aren't that many of them. 419 has so much room to build his deck. He's strong, but versatile.